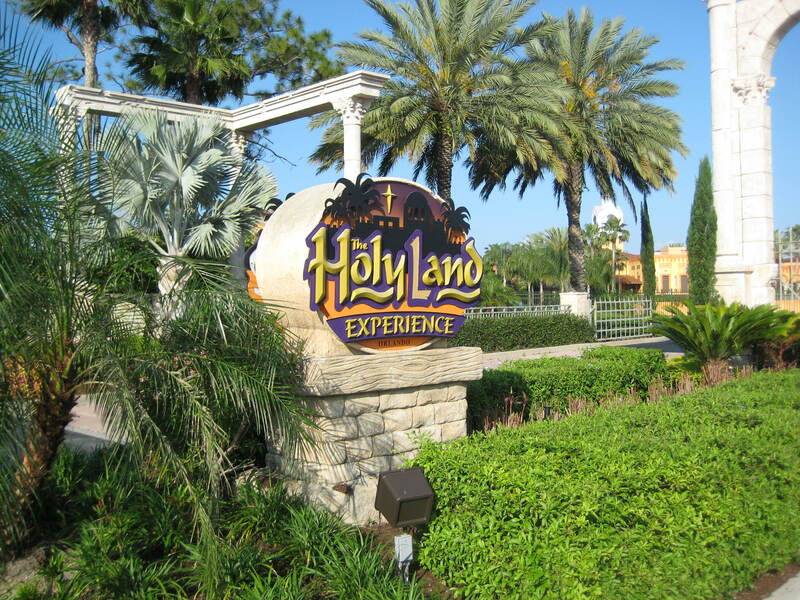 Theme Park Attractions, the Holy Land is a great option for the entire family! 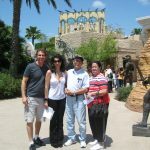 Whether you want to learn more about the Hebrew people, get a historical education, or just have pure fun visiting the land of the Jews without paying the airfare to fly to Israel. The Holy Land has something for everyone! We decided to pay The Holy Land a visit in May. The free parking was very accessible; however, I should caution anyone visiting to wear comfortable walking shoes, because like every good theme park there is always a lot to see. We bought our tickets which cost $35 per person, and entered through the Majestic gates of the Holy Land around 2:00 p.m. in the afternoon. The sun was hot up to 80 degrees so I was glad I wore a sleeveless top. We were given a map featuring all the theme parks attractions, so after carefully studying it we decided to catch the live shows that were only occurring 3 times for the day. The first live show we attended was a talent show. 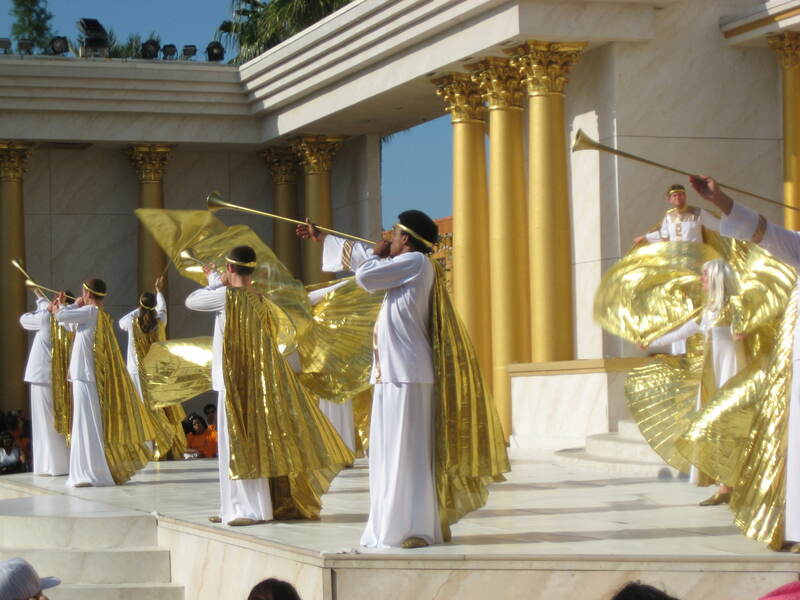 The Holy Land performers were dressed in rich, beautiful costumes representative of the days when Jesus walked the earth. The performers sang beautiful Christian songs and gave the audience hymn books to follow along and also to find a song that they would like to sing, karaoke style on stage. Well there were several folks in the audience that went on stage and rapped a song and said beautiful poetry. It was a sight to see. The talent the audience possessed it was very interactive and a nice way to get audience participation. We were in this live show for about 30 minutes, because the park closed at 6:00 p.m. We were anxious to see some other attractions. We walked through a marketplace, where goods and merchandise was sold and around the corner we beheld a beautiful Jewish Temple trimmed with Gold. The temple was around 60 ft tall and was a most impressive site it marked the center of the Holy Land. There were many shaded areas to sit if you needed a place to rest. Also there were many places to eat. Many visitors were purchasing ice-cream and big icy drinks in fancy cups to keep them cool as they walked through the Holy Land in the heat of the day. 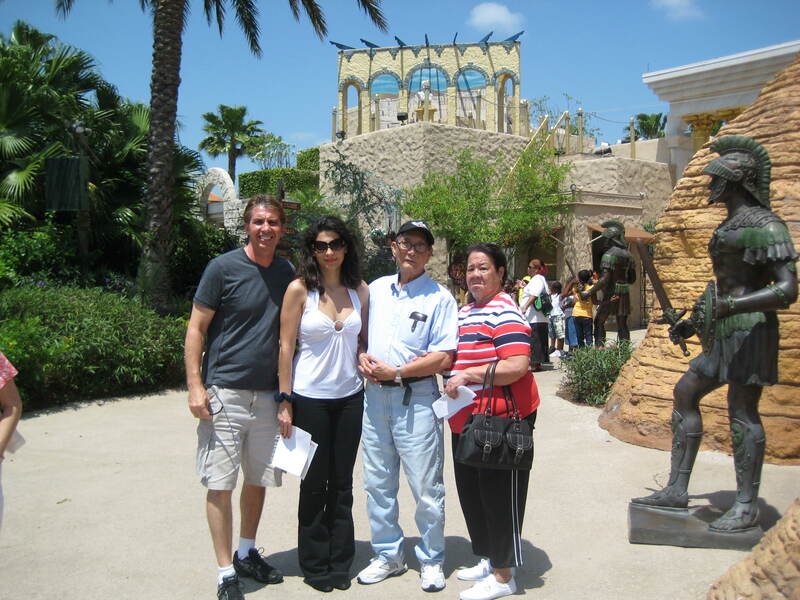 We took photos in several strategical spots in front of the beautiful lake and garden gazebo. 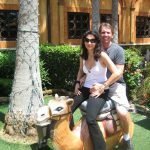 We posed riding a camel as someone took our photos. We rushed to the Holy Communion live show only to find that they were at maximum capacity and we would have to try to make it back for the last show at 4:00pm. outside in a shaded areas with lots of benches until the performers dressed as a Jewish High Priests let us into the building which had a temple setting. We sat on long narrow benches and watched what in my opinion was one of the highlights when visiting the Holy Land. We went back in time to the days when the Israelites dwelt for 40 years in the Wilderness and God had instructed them to build a very modest temple where the Ark of the Covenant was held. This Ark was carrying the 10 commandments. We learnt what the significance of the burnt offering and incense symbolized and much more. It was such a beautiful presentation I did not want it to end. The grand finale ended when the High Priest from the tribe of Levi explained that the burnt sacrifices ceased when the ultimate lamb sacrifice died on the cross for the remission of our sins. He said a wonderful prayer that we repeated after him and then he said another prayer first in Hebrew then in English that was a blessing as we left. We also learnt the meaning of ‘Shabot Shalom’ which means goodbye and go in peace. When we left we passed another live show that we did not get time to see. 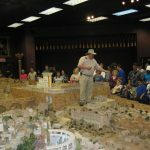 We went to see the Jerusalem Model A.D. 66 the world’s largest indoor model of Jerusalem. 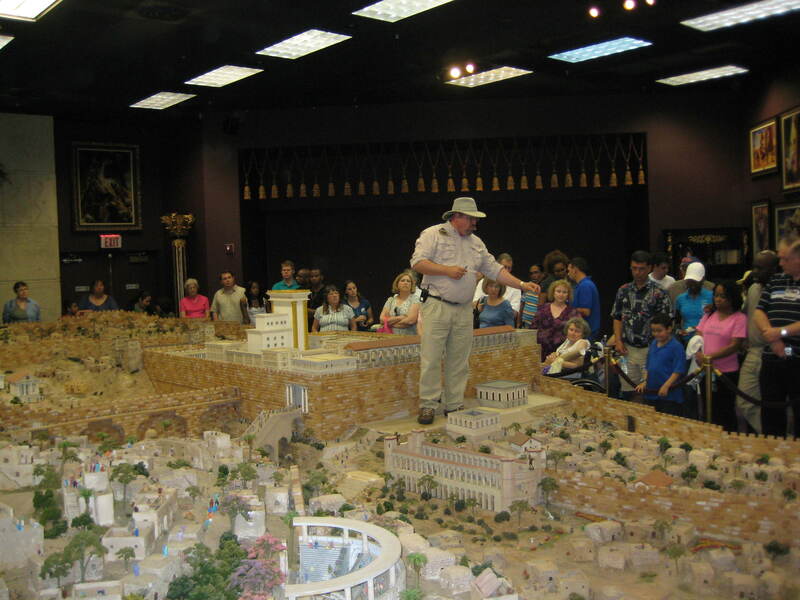 The presentations explained the city’s landmarks and Christ’s final days in Jerusalem. The presentation was 30 minutes but the narrator was so interesting with so many facts and finds not taught in school Even the children paid attention and were in awe of all the great stories and the colorful history of the Jews. After the presentation was over there was a chance to shop and pick up souvenirs. We were a little rushed and realized you need about 5 hours to see everything and we were cramming everything into 4 hours. like Disney, and after 10 minutes we got into a beautiful room that was recreated to look like the upper room where the Last Supper with our Lord Jesus Christ took place. This live show had the least amount of seating so be prepared to stand or sit on the floor. The disciple John spoke about Jesus, and then a cast member dressed as Jesus came out and blessed all the visitors present. Jesus went around the room touching both young and old blessing them. I really felt something spiritual happening in this room as we broke bread and drank wine with Jesus as he prayed and explained the symbolism that the bread would represent his broken body on the cross and the wine his blood shed for the remission of sin. The rest I can’t put into words because you would have to be present in the room as Jesus prayed to feel what I was feeling. I was not the only one feeling it, others in the room were moved to tears, some cried out words of praises. it was not confusing or distracting. it was heart felt as we felt the Holy Spirit move in the room. It was a surreal experience and my words do not do it justice…you must check it out for yourself. When we were leaving they insisted that we keep the authentic little cups that we used to take communion as a souvenir which was a lovely gesture. Well we were counting down until 5:00 which is the main highlight of the day the re-enactment of the Passion of the Christ but before that we had 20 minutes so we went back to the Theater of Life and watched a short 15 minute movie about the passion but from Mary the mother of God perspective. This was very refreshing because the Theatre seating was both cool and comfortable. 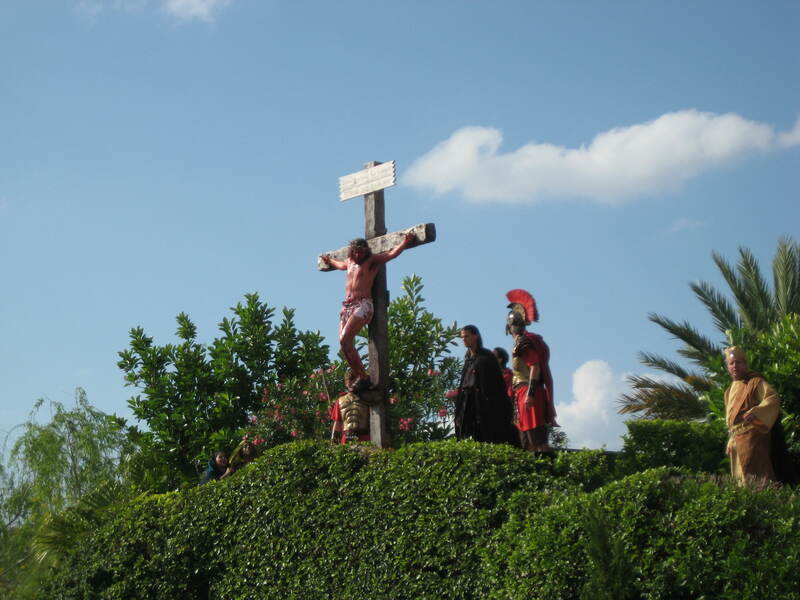 As the movie ended we proceeded outside to the grand finale of the day the re-enactment of the Passion of the Christ. We were instructed by the employees that we could view this only from certain approved areas, so we stood anxiously until the performance started. 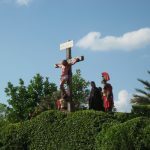 First we witnessed Jesus praying in the Garden, then his arrest, then his judgment by Pontius Pilate, then his brutal whipping by the Roman soldiers that left him bleeding, almost unrecognizable, and then he was crucified on Calvary. I have seen the Passion of the Christ many times but what made this a little different is the character of Satan dressed in black looking evil and glorifying himself in Jesus’ demise almost causing individuals to inflict more pain on Jesus because of his evil and wickedness. Seeing Jesus take his last breath on the cross brought tears to every eye in the crowd as we watched someone innocent suffering the most painful undeserved death recorded in History yet still willing to forgive those crucifying him. I was pleasantly surprised to see one of the Roman Guards that crucified Jesus, testifying after his body left the tomb that He is the Christ. It was very touching and certainly a different perspective. Well anyone with half a thinking brain would probably come to the same conclusion if after witnessing Jesus dying on the cross the skies became dark, the earth quaked, the veil of the temple ripped in two, and much more almost hearing, feeling and seeing God’s anger from Heaven! Jesus is the Messiah. That is because they may not fully understand his story and they certainly did not get the chance to be eye witnesses at his death, burial or resurrection, but for many of those who actually witnessed what happened their lives changed. They were willing to die and be persecuted for what they believed because the body of evidence was overwhelmingly convincing. 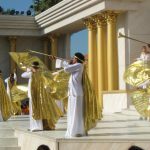 The last scene of the Passion of the Christ had three beautiful angels arrayed in white and gold costumes with gold wings dancing and inviting the entire crowd present to the temple to witness the coming back of Jesus Christ robed as our Kings of Kings. It was a truly delightful event as the crowd clapped and cheered as many angels danced and blew the trumpets to welcome there King of Kings and Lord of Lords.Everyone bowed as Jesus walked proudly crowned and robed as king with a very long purple velvet robe he climbed the stairs blessed everyone and entered into the Temple. I can’t tell you how happy everyone left the Park. It was a perfect ending to a wonderful day and the friends we took that were not particularly religious or spiritual people told us how much they really enjoyed the whole experience.We regret we ran out of time and did not get to see the Scriptorium to Take the incredible journey through history of how we got the Bible and see the authentic, and ancient artifacts from around the world.! 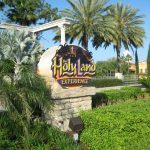 I have had the pleasure to do and see some wonderful things in Florida such as Swim with Dolphins and go to Disney Theme Parks, Sea World, Busch Gardens and Universal Studios and I am proud to add the Holy Land to my list!